I can't agree completely with Mr B on this one. For those of us whose fathers are no longer alive, Father's Day is a time to remember. 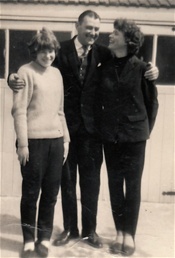 This photo of my dad, Len, with me and my little sister Maggie was taken in 1964. I am so very glad I didn't know then, when this photograph was taken, that I would have fewer than 20 years left with him looking out for me. My Dad had the amazing gift of making even the tiniest event seem special. Here is just one story, of the dozens I could tell. When I was a very little girl, every Friday night in our house was "Surprise Night" according to my father. Home from work, his "surprise" was always the same - Tiny Tots comic for me, Chicks Own for my sister. Yet because of the magic with which he surrounded these loving gifts, every week Friday night was always"Surprise Night" to Maggie and me. Beautiful photo! Mum looks so shy. Grandad looks exactly as I remember him: tall, dapper and with a great, natural smile.